Women’s folkloric skirts will be also available for sale for $50. Learn authentic Afro-Cuban Rumba. Kati gives musical information to help students understand the relationship between the rhythms & dance. 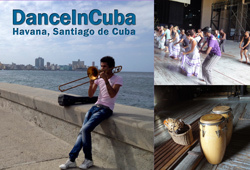 Take a cultural journey with a master teacher born and trained in Cuba! Women dancers should bring long scarves, or long, full skirts. $20, age 16+, both classes $40. Cash only. This class offers a rich taste of authentic Cuban culture and provides an amazing, full body workout you don’t want to miss! Traditional live drumming helps students understand communication between the drums and the dance! 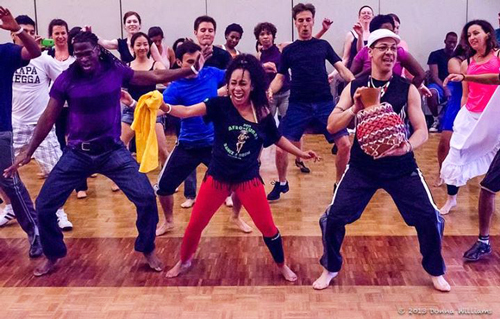 Indulge in a journey of movement to learn songs, rhythm, and dances of Afro-Cuban Folklore. $25, age 16+, both classes $40. Cash only. Kati is available also for private lessons ($65) before the workshop. This is a treat for our Santa Cruz dance scene, for all dance aficionados and also for all salsa dancers. Kati Hernández is a native of Cuba and Afro-Cuban Dance Master who teaches many levels of Afro-Cuban dance in Los Angeles. Afro Cuban dance movements will improve how a salsa dancer looks on the dance floor and feels to a partner. Interpret the music with more “sabor” (flavor), and feel hip movements you never knew you had! Kati’s work is a true illustration of her heritage and an endless high-energy celebration of Cuban dance and music. She is a master of Afro-Cuban dance folklore, dedicated to spreading the treasures of her roots worldwide. Benefit from Kati’s unsurpassed knowledge of traditional Cuban dance, and her contagious, uplifting energy. Experience new ways of expressing yourself through dance. Build strength and agility. 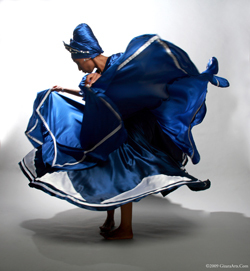 Indulge in the magic and grace that makes Afro-Cuban Dance so special. Kati Hernandez brings to the to the United States her humble, yet explosive and uplifting energy. Kati’s knowledge of dance and choreography reveals her intricate and versatile style, making her a highly sought-after performer, nationally and internationally. Kati’s international journey began where she went to Spain to tour with the well-known orchestra Manolito Simonet y Su Trabuco soon after graduating from Art School in Cuban (en la especialidad de Danza). Kati’s fiery, refined style awarded her the invitation to tour Internationally with several Cuban music and dance productions throughout Portugal, the Bahamas and Costa Rica, where she later resided for five years. This gave her the opportunity to refine her talents in teaching and choreographing dance, and to expand her range as an actor and dancer/choreographer for television. Kati also volunteered her time and skills teaching dance to children and young women in impoverished communities throughout Central America, empowering them to use dance as a medium for expressing emotions, experiences, hopes and dreams. Following her extensive travels, Kati moved to the United States. In California she taken on the responsibility to teach and cultivate Afro-Cuban culture by producing regular events and workshops that create a community that bridges dance and music across cultures. She is the co-founder of KimBamBula Production which produced the annual “Essence of Cuba”, a paramount reunion of Afro-Cuban masters in Los Angeles including members of the renowned group Los Muñequitos de Matanzas with California’s finest Cuban folkloric masters. Kati recently created one of her dream projects, “Isupo Irawo”, an ensemble of Legendary Afro-Cuban masters from around the world. This group features Maestro Lázaro Galarraga, one of founding members of the Conjunto Folklorico de Cuba, who has been a lifelong inspiration to Kati, and recently a mentor to her development. 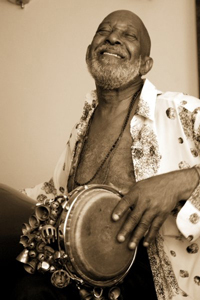 Their most recent performances include the Esalen International Music and Dance Festival and the opening act for the world-renowned Brazilian jazz percussionist Airto Moreira at Avila Beach, CA. Kati’s other accomplishments in Los Angeles include: The Ford Amphitheater popular Cuban music production of “La Charanga Cubana” , “Tropicana in Hollywood” where she was a choreographer, costume design advisor and production coordinator; the dance installation “Fire”directed by Judith Davis and presented at Pomona College; UCLA’s film project, “Raiz” and choreographed for the Santa Monica College dance company Global Motion In addition, She is praised for her tribute piece to legendary Afro-Cuban master percussionist Francisco Aguabella at Esalen in Big Sur, CA.g dancer Kati guest teaches dance classes at several southern California colleges and universities including the University of California, Irvine, as well as in many local studios as throughout Los Angeles. She continues to tour, bringing her flavorful Afro-Cuban dynamite to national Afro-Cuban folkloric and salsa dance conferences. Currently, Kati is the artistic director and choreographer of her own community-based, Afro-Cuban dance and music experimental project, Afro-Cuban/ Casino (cuban salsa) “KimBambula” and “Pa’ La Orilla”.